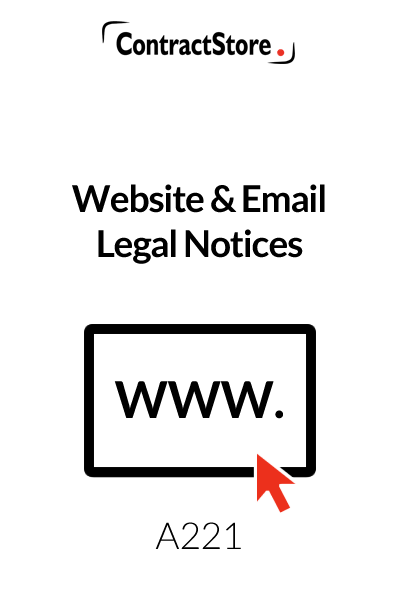 Website legal notices are becoming increasingly important. Did you know that under English law you must display certain information about your business on your website? This document contains template wording to ensure you are up to date. Useful legal phrases for your email signature. This document can help your business comply with the Companies Act 2006, and Electronic Commerce Regulations (EC Directive) 2002 and the EU Regulations relating to Alternative Dispute Resolution. The Privacy Notice is designed to support you in GDPR compliance regarding data collection. 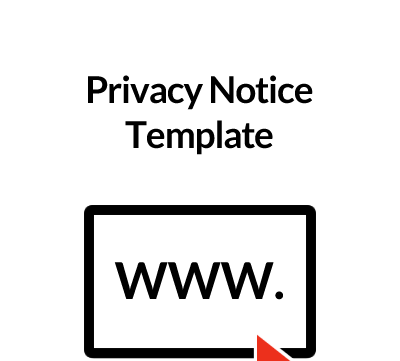 You need this document if your business uses the internet or email to communicate with colleagues or clients, and you want a clear, straightforward website legal notice and email policy. This document contains templates for information that is usually found on websites. Some of this information is required by law. The disclaimer notice and statements concerning copyright and third party links are ‘optional extras’: they may not be necessary but notices of this type are often found, in a variety of forms. and, if the company is being wound up, that fact, on all of their websites. A common place to put this information is in the “About us” Section. It does not have to appear on every page. This rule also applies to any emails sent by a company so the same information should appear in the footer to each email. If your website refers to prices, these must be clear and indicate whether they include tax and delivery costs. 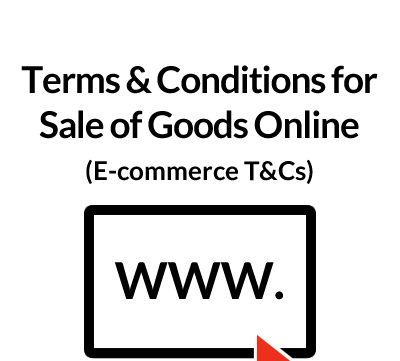 If you are selling online you also have to comply with the Consumer Contracts (Information, Cancellation and Additional Payments) Regulations 2013. These are not covered in this document but see our Terms & Conditions for Sale of Goods Online- Document A179 and our free guidance note, Z171. If you provide services, either on their own, or as well as goods, you also have to comply with the Provision of Services Regulations 2009 which are in effect in a similar form throughout the EU. These Regulations oblige you to provide a lot of information to clients and potential clients including having a complaints procedure and making available your terms of business and insurance details. Although it is common practice to include a disclaimer on a website, arguably it is not necessary and its legal effectiveness is open to question. If you want to have a disclaimer notice, then keep it short unless there is some reason to have several paragraphs of text. 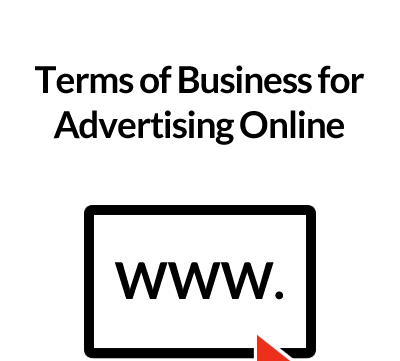 A website, for most online companies, is equivalent to a shop window and you would not expect to see a disclaimer notice when you go into a shop. If, however, you are providing information that might be relied on, such as legal information, then it does no harm to tell the visitors that they use it at their own risk. Under English law the author of a document or drawing owns the copyright and, in the absence of an agreement to the contrary, no-one else has the right to make use of it. In some countries it is necessary to assert ownership of the copyright and, on the web, it is therefore sensible to make it clear that you own the copyright to the words and pictures on your website. Having said that, one purpose of a website is to allow visitors to read and copy or forward to other people information from your website. So it can be counter-productive to state, as some websites do, that nothing may be copied or used without consent, as this would, if obeyed, prevent a visitor from noting down your phone number. Our wording tries to achieve a balance by allowing copying for personal use or for information, but prohibiting it for commercial use. Here again a notice is probably unnecessary under English law but it does no harm to disclaim any responsibility or liability for any third party website to which you have created a link. It is usually in the interests of a website owner to allow links to it, since this can improve its position on the search engines. The main point here is to give notice that you may want to have the link removed – e.g. if an unacceptable site created a link to your website – and to avoid use of your trademark or logo without consent. “Our website uses four cookies. A cookie is a small file of letters and numbers that we put on your computer if you agree. These cookies allow us to distinguish you from other users of the website which helps us to provide you with a good experience when you browse our website and also allows us to improve our site. In addition there are European Regulations on privacy and electronic communication which apply throughout the EU. There is no necessity for an introduction but you must identify the data controller and provide contact details. If the controller has a representative or a data protection officer, that person must also be identified. So you need to fill in the blanks and adjust as needed. It is helpful but not mandatory to have a statement of principles and to make it clear you comply with the law. An important part of the notice. You should, in line with the principles referred to at the beginning of this note, specify clearly why you collect and process data. Those purposes should be adequate but also limited to what is necessary. Broadly, you are OK if you need data for contractual or other legitimate reason – e.g. to fulfil a sale you need an address and credit card details. When you use third parties to process data – e.g. Paypal or Worldpay to process payments or a ticketing company to sell your tickets or a bulk mailer for your newsletters, these need to be identified. And beware – some of those organizations like to use the opportunity to capture and process your customers’ data for their own purposes. They need to get consent for those uses, or you should get consent on their behalf. If any data processor is located outside the EU, you need to tell the individual and satisfy yourself that they have adequate data protection systems. Some countries are not acceptable under GDPR. The law says this should only be for as long as necessary. Sales information usually has to be kept for six full tax years. Contracts usually have a six year period after they are completed in which a claim may be brought. In the case of mailshots, if someone consents to receiving these, it is not unreasonable to keep the relevant data for as long as they keep receiving the emails. And be sure to let them unsubscribe on every occasion. The wording summarizes the GDPR position. It is important to have a good database so that you can easily access all the personal data for each individual with whom you deal. This is a GDPR requirement. This is a reminder for you as well as your visitors – if you change your policy you should inform the people whose data you hold and get their consent, when necessary. This is not essential if you have contact details in the opening paragraph. If you want to send out newsletters or maintain regular (or irregular) contact with the individuals whose information you hold, the individual has to give explicit consent – so make it clear what the reasons are and set up the consent form very clearly on your website – a small tick box with inadequate explanation is no longer enough. If you have people on your mailing list already, you need to consider, and maybe get legal advice, on whether to ask them again for consent, in order to be sure you are compliant with the GDPR. Also, you should make it clear in all your communications that they are entitled to have their details removed from your list. And do remember it is in your interests to have a procedure to do this – quite apart from the legal implications, there is nothing more irritating for someone than to keep receiving material from an organization that is of no interest after he/she has asked to be removed from the mailing list. As mentioned above, there are legal requirements for companies in the UK which now include putting on each email sent by a company, its full name, registered office address, and company number. VAT number is also recommended. It is also common practice to insert a Disclaimer, designed to deal with the possibility that an email is received by someone other than the intended recipient. Our wording is quite brief, but should suffice for most people. You might also consider joining our affiliate scheme when you can earn commission on sales made via your website. For more information go to this link: Become an Affiliate. 2. 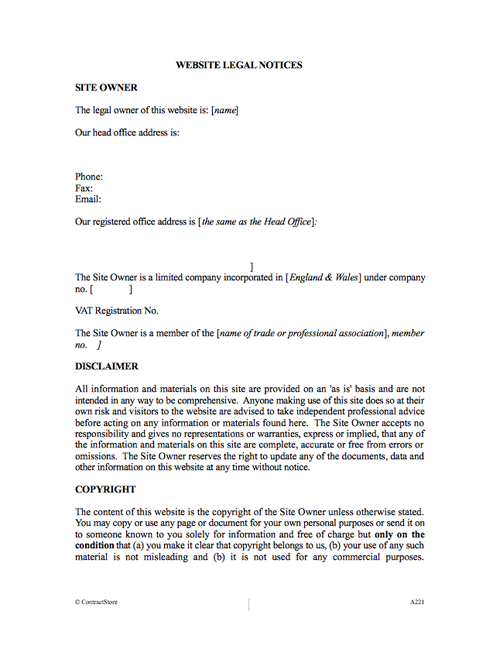 We recommend that you obtain legal advice before using our templates.